Somewhere out there . . .
Somewhere out there, lies a whole world of opportunity that is waiting for you. Somewhere out there, are things you only thought possible in your imagination. Somewhere out there, opposition that you’ll have to face. Somewhere out there, life is waiting for you. Life is about living. Good things, bad things, and everything in between is all a part of life. Don’t hold back from trying something because you’re afraid of failure. Don’t ignore something you want to do simply because it doesn’t fall into “socially acceptable norms.” It’s your life; you’re the one who has to live it. Don’t know where you’re going? 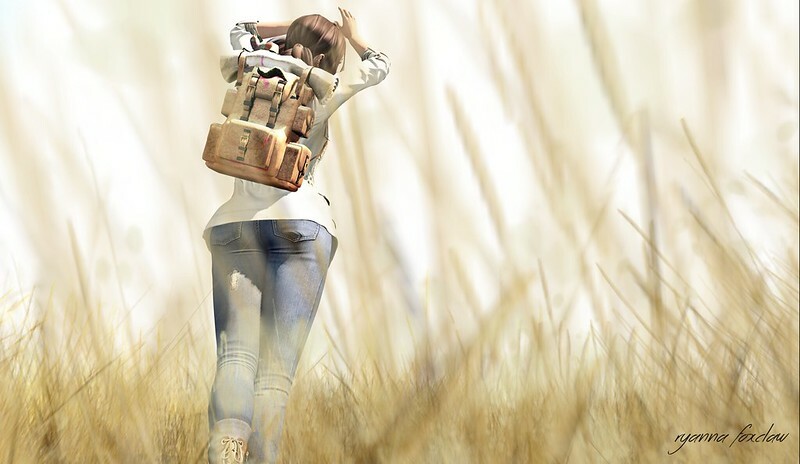 Are you feeling lost in life? That’s okay too. No one has everything together all the time. Life throws us curve balls and monkey wrenches, and all we can do it handle them the best we can. Such is life and all the vicissitudes therein. The world is waiting for you, somewhere out there. Called upon . . .
inside the confines of a glass ball. trails of the human plight. never would she personally intrude. And though given power to help, she would not. “It’s not my place to get involved,” she’d say. the damage done to her own being. Don’t let anyone tell you who you can’t be friends with, talk too, or hang out with. You don’t have to agree with the opinions of others. Befriend a squirrel, it may be the best choice you’ve ever made. Always home . . . They moved around a lot – some may even call them vagabonds. A couple months here, a few months there, they adopted to living out of cardboard boxes, only ever unpacking the essentials. Another city, another house, new neighbors, and new jobs. Moving around wasn’t always easy, so they learned to never put down solid roots. However, no matter how many times they moved – whether their next home was big or small – if they had each other they had everything that they needed. Walk in a lit field . . .
let’s speak of desires . . .
Join me in the sun. Grab a bag, toss on some clothes, and head out the door. Yesterday is gone. Tomorrow may never come. All we have is today. Right now. This moment. This time. What are you going to do with the time you have? An Evening Drink . . .
She had the start of their evening all planned out – a bit of wine to relax before heading out to dinner. The evening was getting on and he would be coming home soon. She had put on that new dress she brought from TSR and accented it with a stole, and one of the pearl necklaces that he liked. Perhaps she was overdoing it, but it was about her plan. And that made her attire a requirement. After she was dressed she rummaged around for the pad of sticky notes and directed the dog to wait at the door. On the note she wrote: “A tall drink awaits you” and stuck it on the inside of the door’s frame. She smiled to herself, thinking that it was both witty and clever. Patting the dog on the head she went to pick out a wine. He had quite a collection and she was still a novice at wines and had yet to taste them all. She tapped a finger against her lips as she scanned the shelving, pulling out a bottle here and there to read the label and check the date. The last thing she wanted to do was waste a bottle. She was so focused on finding the perfect bottle that she hadn’t heard the front door open, or him coming down the hallway. “You look gorgeous.” The husky tone of his voice broke through her concentration and she spun around, a bottle in one hand, while her free hand rested on her chest. “I didn’t even see you!” Was her reply. The initial shock wearing off as her eyes openly traveled over him. The first thing she noticed was that he had already loosened his tie. Now he had placed his briefcase on the chair with her purse and was steadily closing the distance between them. Color instantly sprang to her cheeks and she began to giggle and blush. That look in his eyes was all too familiar. 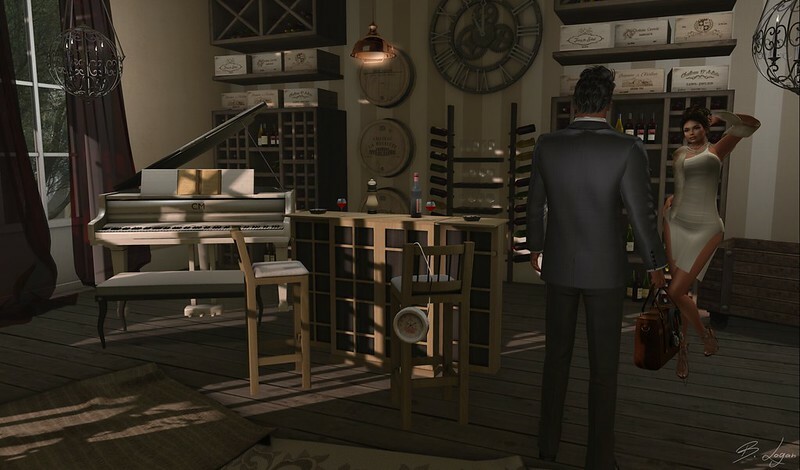 She took a step back, however there wasn’t anywhere to go seeing as she was surrounded by wine glass and their piano. She placed the wine and a hand on the bar to steady herself. “We have dinner plans out tonight. You best behave.” She tried to compose herself. He walked past her, admiring the dress she had chosen. “How much time do we have?” he asked firmly, standing directly behind her now, tracing his middle fingers down her arms.